This is probably the worst version of "Heroes" - ever! As to see on the Picture of my new Release all Info is accurate and it's a new Release! This flied around on bootleg for a few months and has caused a massive fuss! After this, it was cleared for an official release. David Guetta has re-tweaked it so you have sweaty palms the fully reallsed version plus an exclusive dub mix on the flip. "Just For One Day" was never meant to be released. 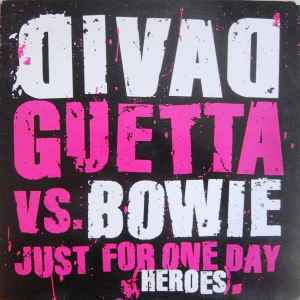 A bootleg created by David Guetta to complete on the decks was its sole purpose. That plan was short lived. The minute it was heard by Casius and Thomas Bangalter in Amsterdam at the end of 2002, it was destined to be heard by the masses. The first to pick up on the bootleg in the Uk were Pete Tongand Erol and since then has been a favourite with the likes of Tom Middleton, Darren Emerson, Judge Jules, Seb Fontaine, The Sharp Boys, Tall Paul and lots of many gears.